Okay, they're more like robot hinges, but we're not complaining. A few years have passed since Razer brought something really crazy to CES. A webcam, an external graphics amplifier, an ultrabook—all fine products. But therein lies the rub: Stargazer, Core, and the Blade Stealth became products. Nothing’s matched the “Holy ! 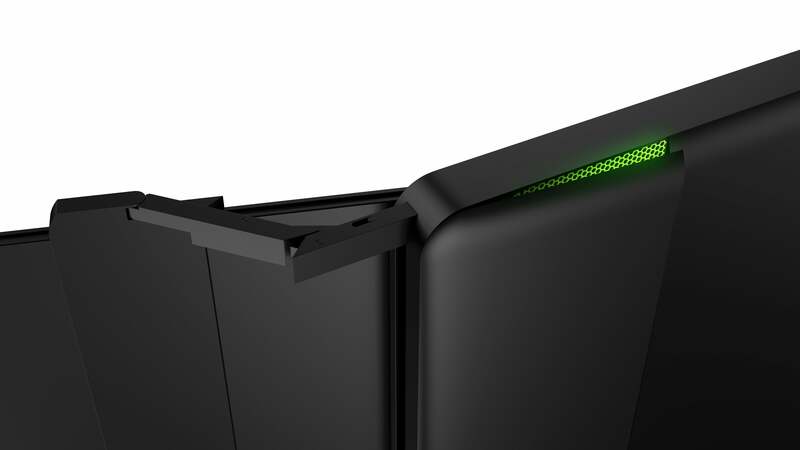 @^#@” appeal of 2014’s Project Christine, a modular PC concept so weird and futuristic it immediately turned heads. Aside from the trio of displays, it’s essentially a Blade Pro. You get the same GTX 1080, same Razer-designed low-profile mechanical switches, and same Chroma lighting. You don't get the same weight, however. We’re really venturing into “semi-portable” territory when discussing Project Valerie. It's 1.5 inches thick (or approximately two Blade Pros stacked) and weighs about 10 to 12 pounds, so you’re probably not going to take this laptop everywhere. This is true desktop-replacement material. What a crazy idea. It’s not the first multi-screen laptop—I dug up this ol’ article about the Lenovo ThinkPad W700ds, and there’s the gScreen SpaceBook from 2011. But I think three displays is a new one, and especially three displays of this quality. However, as amazing as Project Valerie is, we need to talk about why it's destined to remain a beautiful dream--at least for consumers. 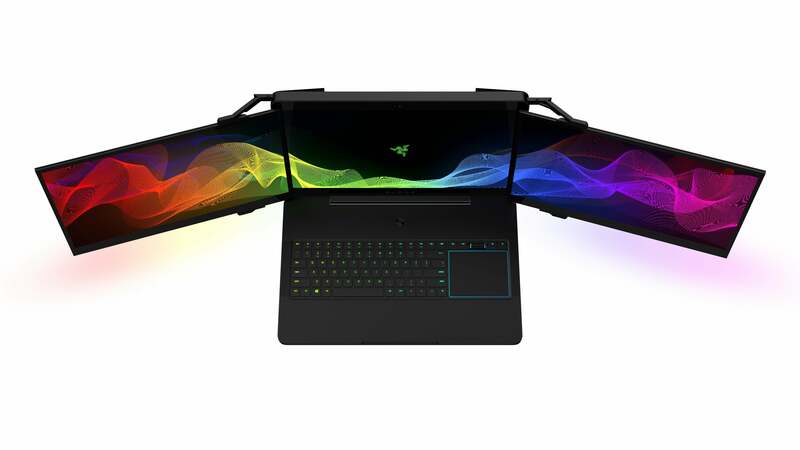 Sure, it's possible Razer will surprise us and put Project Valerie on sale later this year. But if that happens, expect Valerie to cost more than a decent used car. 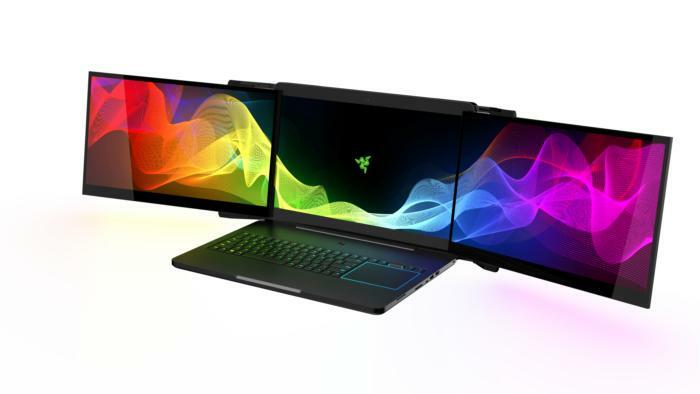 The Blade Pro already starts at $3,700 with prices ranging up to $4,500—and it doesn’t even have robot arms. $5,000 seems like a safe “Price is Right”-style guess. Actually, even $6,000 isn’t a stretch. Razer also hasn't said anything about battery life yet. A battery takes a hit for every pixel it powers, so the jump from a 1080p screen to 4K means a laptop dies faster. Another jump from 4K to 12K? You might as well not even have a battery. Considering the Blade Pro already includes the largest battery allowed on airplanes (99WHr) and only gets 3 to 4 hours, you’d better have an outlet on hand for Project Valerie. And don’t get me started on what happens if you shove Valerie into a narrow cubbyhole and tell it to deploy the extra displays. When I spoke to Razer, I was told it was currently up to user discretion when to deploy, with no safety measures. Goodbye, expensive laptop. But the realities of Project Valerie are boring. Like Project Christine, this is a concept that’s way more fun before you start asking questions. A three-screen laptop! With robot arms! 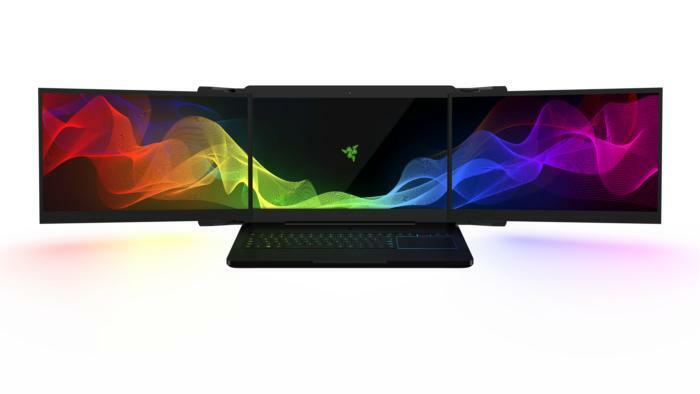 The best aspect of Razer’s out-there designs is they still always seem so plausible, like they’re ten years away--a dream you can glimpse over the horizon. In a sea of boring me-too gadgets and incremental upgrades, Razer’s ideas are fun. Even when they don’t come to fruition.